The BumperBlocker Set provides complete front AND rear bumper protection. The BumperBlocker wraps from wheel well to wheel well, leaving no area of your bumper exposed or unprotected. We do not recommend the BumperBlocker for vehicles that have flush wheel wells or poor anchor points for the end hooks. The Bumper Blocker requires a good anchor point for the end hooks - this is the part that secures the product at the edge of the bumper. If the plastic wheel liner and bumper edge are perfectly flush there is no good anchor for the hooks to grasp onto. Some American cars from Ford and Chevy have flush wheel liners. So, you need to look at your vehicle and decide. IF you are unsure, send us an email by using Contact Us. Remember, your front rear bumper may be different so check both. We do not recommend the Bumper for vehicles that have flush wheel wells or poor anchor points for the end hooks. WARNING:Bumper Blockers should never be used on vehicles where the exhaust pipes are located in the rear bumper. If the exhaust pipe is located in the rear bumper of your vehicle, using the BumperBlocker properly is nearly impossible. BumperBlockers should never come in contact with the vehicle exhaust pipes. 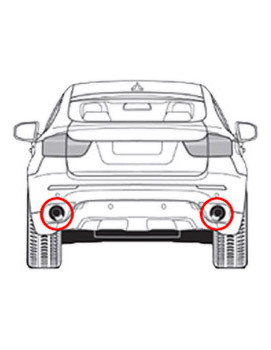 To be installed properly, the BumperBlocker must span across the rear bumper, on vehicles where the exhaust pipes are located in the rear bumper, proper installation and use is not possible. Use of the Bumper Blocker improperly on vehicles with the exhaust located in the rear bumper can cause damage to either the product or the vehicle when an obstruction occurs. Bumper Blocker's will not work on Extra Small Vehicles (Mini-Cooper or Smart Car) or Extra Large SUVs (Expedition, Excursion, Escalade or Denali). Best protection against the guys @ the garage! Best total protection for plastic bumpers @ the garage. Easy to put on and take off. A lot cheaper than repainting them every couple of years.